With a verified paid circulation of 404,5731, you would think that New York Magazine would offer a small honorarium to immigrants who are photographed for the magazine. The bi-weekly New York Magazine is a limited liability company (LLC) with a cover price of $5.99 and an annual subscription cost ranging from $25 to $29.97. In September 2014, New York had the biggest growth for online traffic in the company’s history with 27 million monthly unique visitors across it’s web properties (NYmag.com, Vulture, the Cut, Grub Street and Science of Us)2. 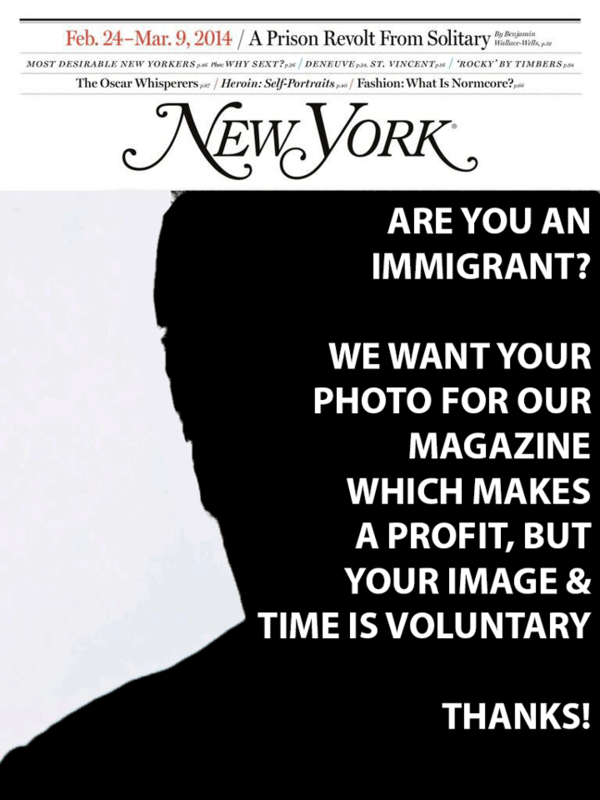 The magazine has claimed that it’s newsstand business remains highly profitable3 and yet it expects immigrants to be photographed and featured in the magazine to voluntarily offer 2 hours of their time. What: Looking for New York immigrants from ALL walks of life— this can include babies, infants, grandparents, mothers, daughters, sons, everyone. From diverse neighborhoods and ethnic communities all over the 5 boroughs. Immigration Status doesn’t matter!!! Only requirement you must be born in another country and live here in NY. Feel free to pass this along to a friend of family member. This is a journalistic project therefore theres no rate for it. So then I replied – am I to understand that the photo shoot, feeds NY Magazine content that is sold to buyers and subscribers and will help promote Platon’s career, whom I assume is paid for taking the photographs, but the subjects get nothing for their time? If so, it seems as if the magazine and photographer are taking advantage of immigrants based partly on the current political environment in this country. Amazing citizens whose portraits will help sell the magazine and yet not even a small honorarium for their time. I am a CUNY professor with a lousy salary for New York City and when I work with immigrants on an art project, I always put aside an honorarium for their time. In a latest project, I budgeted $120/hour for 10 interviewees. I have a tiny budget and no expectation of a profit on an artistic project, yet, I respect the people who work with me and their time hence I offer an honorarium. It’s unbelievable that a successful magazine can not do the same. This morning I was up with my family at 6am to vote. We got to the Brooklyn Museum and the lines were already getting long. People were excited, looking forward to the end to this much too long presidential campaign and surprisingly, people appeared to be in good moods, even at 6am facing growing lines! We entered in to continual war on false pretenses as there were no weapons of mass destruction. We entered in to the worst financial crisis since the Great Depression resulting in evictions, foreclosures and prolonged unemployment. The world has a more positive image of the United States of America. Obama ordered U.S. military forces out of Iraq. Signed $787 billion American Recovery and Reinvestment Act in 2009 to spur economic growth that has lead to the current unemployment rate of 4.9%, consistent with pre-crisis unemployment rate. Established universal health insurance, signed the Affordable Care Act (2010) giving millions of uninsured Americans health care, a quality of life right in wealthy countries. Signed 2009 Children’s Health Insurance Authorization Act, which allows the Children’s Health Insurance Program (CHIP) to cover health care for 4 million more children, paid for by a tax increase on tobacco products. Signed the Dodd-Frank Wall Street Reform and Consumer Protection Act (2010) to re-regulate the financial sector after its practices caused the Great Recession. Eliminated Osama bin laden, something that President Bush was incapable of executing while helping send an entire region of the globe into prolonged war. Reversed President Bush pointless Torture Policies. Released new fuel efficiency standards in 2011 that will nearly double the fuel economy for cars and trucks by 2025. Signed Omnibus Public Lands Management Act (2009), which designated more than 2 million acres as wilderness, created thousands of miles of recreational and historic trails, and protected more than 1,000 miles of rivers.